The 1st test between Pakistan and Zimbabwe at Harare has been ended. Zimbabwe lost the match against Pakistan but proved to be a good opponent. Pakistan won the match by 221 runs and leads the series by 1-0. In the first innings Pakistan couldn’t able to make 250. The innings ended by 249 where Pakistan captain Misbah-ul-Haq and Azhar Ali gave a good stand with 53 and 78 respectively to reach 249. 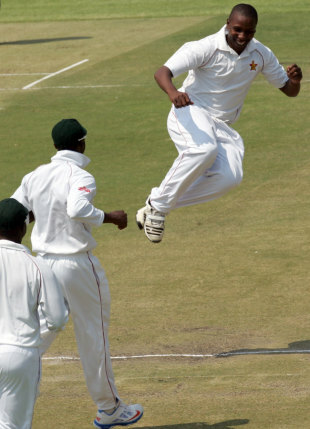 Zimbabwe bowlers Chatara and Panyangara took 3 wickets each whereas Masakadza and Utseya took two wickets each. In the first innings, the top order batsman of Zimbabwe have missed to prove them. Middle order batsman gave a good play and made Zimbabwe move forward in first innings. Sikandar Raza with 60, Malcolm Waller with 70 and Elton Chigumbara with 69 gave Zimbabwe a good score. Finally Zimbabwe ended its 1st innings with the score of 327 by all its wickets down. Pakistan bowling side has been ruled by Ajmal as he took 7 wickets and Junaid with 2 wickets and Rahat Ali with 1 wicket. In the second innings too Pakistan top order batsman had not made their way for a good strat. Azhar Ali who gave a good score in 1st innings had gone for duck in the 2nd innings. On the fourth day, Zimbabwe had a hope of taking the match on their side because at that time, Pakistan were only 90 runs ahead and already 4 wickets down in their 2nd innings. As a captain, Misbah-ul-Haq gave a decent score of 52. Younis Khan turned the second innings in favor of Pakistan. His double century made Pakistan to attain 419. 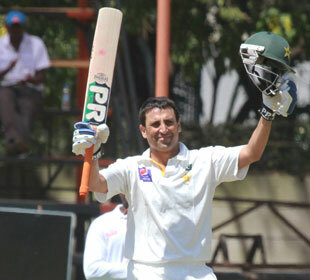 After Younis Khan reaching his double ton, Pakistan declared the second innings for 419/9 with a lead of 341. On the bowling side Utseya took 3 wickets whereas Panyangara and Chatara took 2 wickets and Masakadza took 1 wicket. Zimbabwe were set with a target of 342. But the game turned in the hands of Spinners. Pakistan spinners bowling was good and made the way to end Zimbabwe second innings for 120. Thus Pakistan has defeated Zimbabwe with 221 runs. Ajmal and Rehman took 4 wickets and Junaid Khan with 2 wickets. Finally the 1st test ended with Pakistan win. Younis Khan got the man-of-the-match award for his excellent double century undefeated. Misbah-ul-Haq, Pakistan captain said that they had not played many test matches for a long time and they to improve them. He also added that Zimbabwe gave a good fight back and showed their improvement of being a good opponent. Pakistan fans accept that there is no tour matches for Pakistan and hence Pakistan is not able to play in their home ground. Zimbabwe showed their good opposition due to their home ground. This is the Pakistan fans opinion towards this struggle in the match but really Zimbabwe proved to be best as said by Misbah,Pakistan captain.